Our education strategy is two fold. Dunia Designs' philosophy is to teach and raise environmental awareness through education and design. Through the profit from your purchases, Dunia Designs help children, teenagers and adults return to primary, secondary and third level education. We run teaching programs in schools and businesses. We teach about the damage that plastic pollution can cause our seas, water sources and the ozone if it is not recycled or reused effectively. This couch was made using 268 bottles. The pouffes contained 16 bottles. and the ottoman, 48 bottles. All cushioning is made using cleaned and shredded plastic bags. "The Proof is in the Pouffe!" 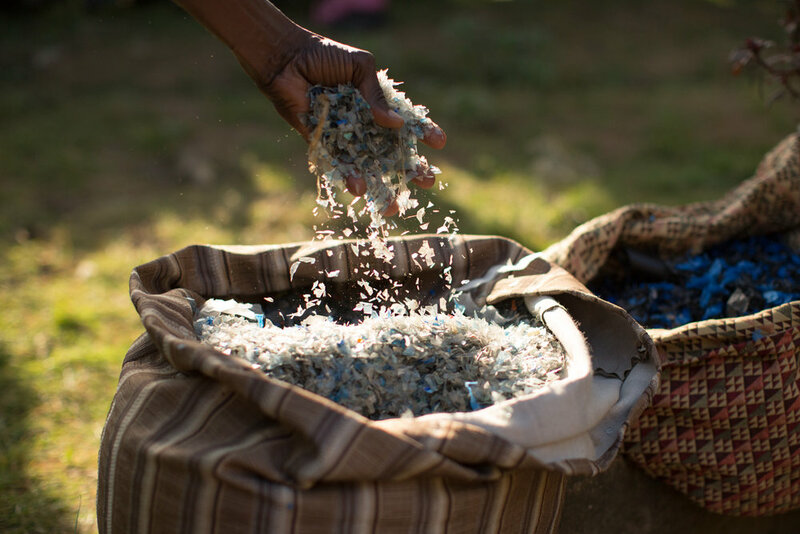 Shredded Bags: Shredding of collected and cleaned plastic bags as an alternative to cushioning in traditional furniture design.